The second historically documented Egyptian pyramid is attributed to the architect Imhotep, who planned what Egyptologists believe to be a tomb for the pharaoh Djoser. Imhotep is credited with being the first to conceive the notion of stacking mastabas on top of each other — creating an edifice composed of a number of “steps” that decreased in size towards its apex. The result was the Step Pyramid of Djoser — which was designed to serve as a gigantic stairway by which the soul of the deceased pharaoh could ascend to the heavens. Such was the importance of Imhotep’s achievement that he was deified by later Egyptians. The most prolific pyramid-building phase coincided with the greatest degree of absolutist pharaonic rule. 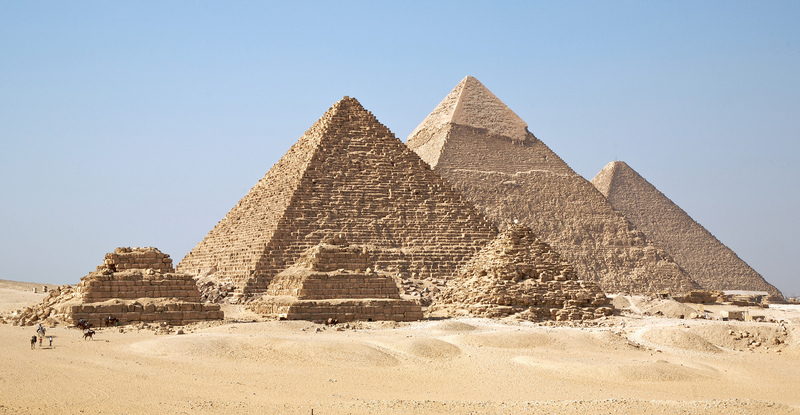 It was during this time that the most famous pyramids, those near Giza, were built. Over time, as authority became less centralized, the ability and willingness to harness the resources required for construction on a massive scale decreased, and later pyramids were smaller, less well-built and often hastily constructed. Long after the end of Egypt’s own pyramid-building period, a burst of pyramid-building occurred in what is present-day Sudan, after much of Egypt came under the rule of the Kings of Napata. While Napatan rule was brief and ceased in 661 BC, the Egyptian influence made an indelible impression, and during the later Sudanese Kingdom of Meroe (approximately in the period between 300 BC–300 AD) this flowered into a full-blown pyramid-building revival, which saw more than two hundred indigenous, but Egyptian-inspired royal pyramid-tombs constructed in the vicinity of the kingdom’s capital cities. Al-Aziz Uthman, son of the great Saladin who crushed the Crusaders, tried to demolish the Great pyramids of Giza, but had to give up because the task was too big. However, he did succeed in damaging Menkaure’s pyramid. 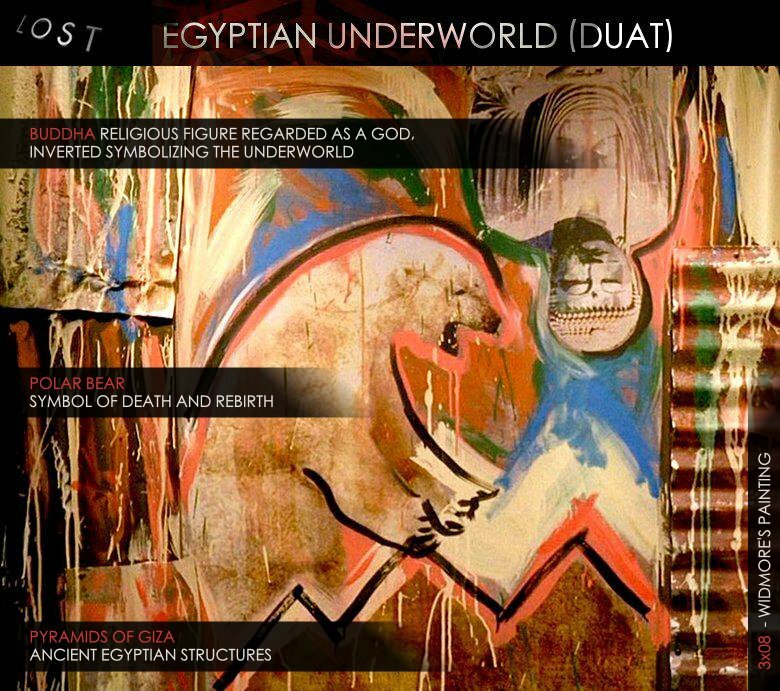 One painting, in a style reminiscent of the mural painted on the Swan’s wall on the Island, has polar bears, an inverted Buddha, mountain peaks (Pyramids of Giza), the word Namaste, the Statue of Tawaret before demolition on it. Also, the painting feels that the island is under the water as in “LA X, Parts 1 & 2”. It and the third painting are on the wall opposite of the bar. Many viewers initially thought that the Namaste was written backwards. In the actual filming and the majority of the scene, the painting appears to Desmond’s left, with Namaste written correctly. In initial shots the film was reversed, causing the painting to appear on Desmond’s right with Namaste written backwards. It is unknown if this was intentional or not. 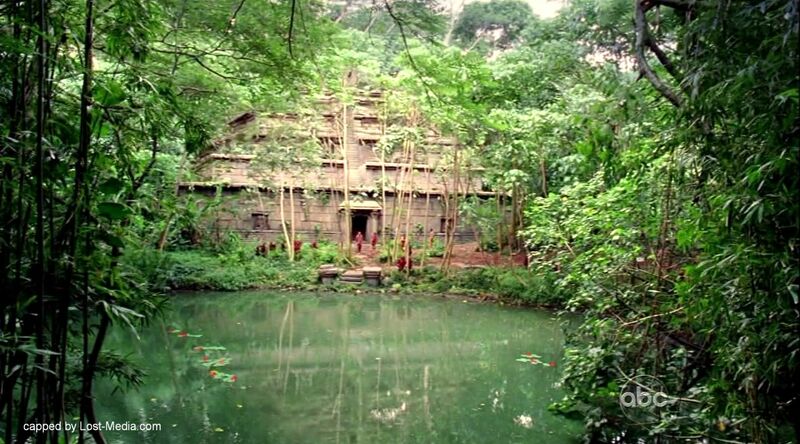 The Temple is a sanctuary in the Island’s Dark Territory where many of the Others used to live. A massive, crumbling wall half a mile away surrounds it, and an extensive network of ancient tunnels and chambers exists beneath it. One particular chamber has a connection with the Monster. The Man in Black attacked the temple in his smoke monster form shortly before his death, killing all inside who did not join him. (“Sundown”) The Temple has subsequently been abandoned. 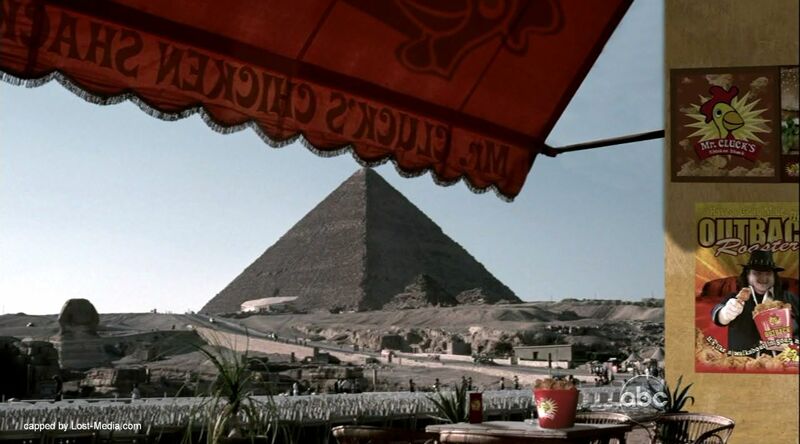 During the retrospective film of Hurley’s life at the ceremony to award him Man of the Year, the Pyramids & Sphinx are seen in the background of a Mr Cluck’s Restaurant in Egypt. 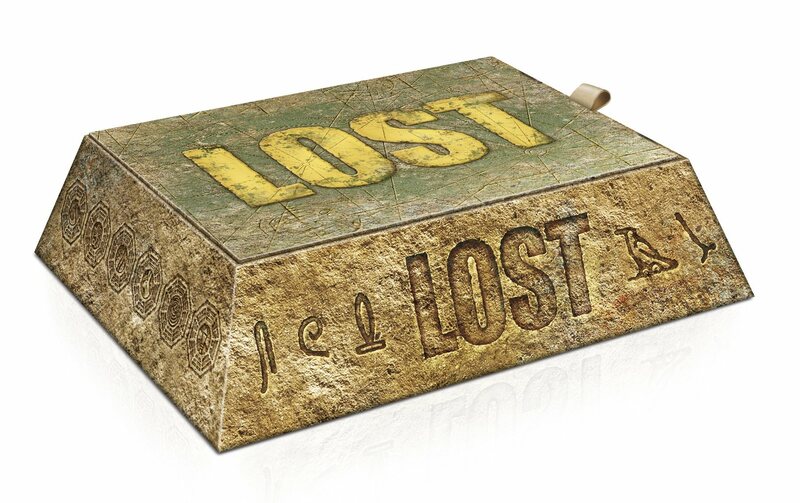 The Premium Boxset can also be seen to resemble a truncated pyramid (with the capstone missing). Yet again reinforcing the Egyptian theme covertly interwoven within the series. The Great Sphinx of Giza (Arabic: أبو الهول‎ Abū al Hūl, English: The Terrifying One), commonly referred to as the Sphinx, is a statue of a reclining or couchant sphinx (a mythical creature with a lion’s body and a human head) that stands on the Giza Plateau on the west bank of the Nile in Giza, Egypt. It is the largest monolith statue in the world, standing 73.5 metres (241 ft) long, 6 metres (20 ft) wide, and 20.22 m (66.34 ft) high. It is the oldest known monumental sculpture, and is commonly believed to have been built by ancient Egyptians of the Old Kingdom in the reign of the pharaoh Khafra (c. 2558–2532 BC). The Sphinx is located beside the pharaoh’s Valley Temple and the covered causeway that led to the Mortuary Temple beside the pyramid. It was sculpted from an outcropping of limestone and represented the sun god; its features were probably those of Chephren, the builder of the second pyramid at Giza. While it has a god’s face, it has a lion’s body. The one-metre-wide nose on the face is missing. Legend has it that the nose had been broken off by a cannon ball fired by Napoleon’s soldiers during the Battle of the Pyramids in 1798. 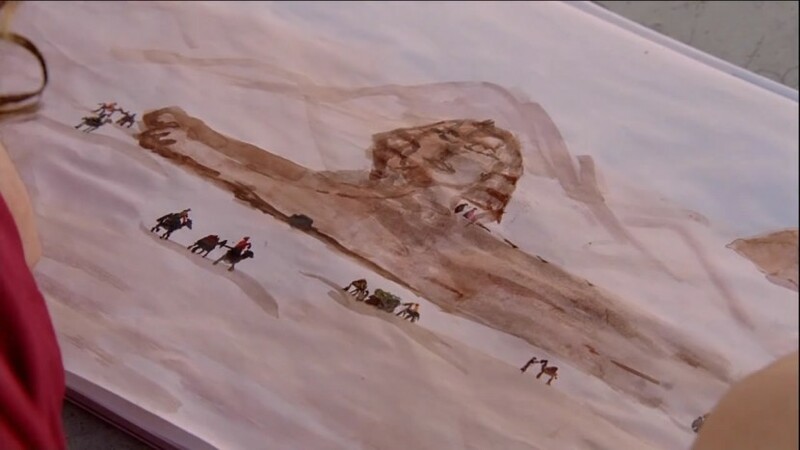 However, the story is only legend as sketches of the Sphinx by Frederick Lewis Norden made in 1737 and published in 1755, prior to the French invasion, illustrate the Sphinx already without a nose. The Egyptian historian al-Maqrizi, writing in the 15th century, attributes the vandalism to Muhammad Sa’im al-Dahr, a fanatic Sufi Muslim from the khanqah of Sa’id al-Su’ada. In 1378, upon finding the Egyptian peasants making offerings to the Sphinx in the hope of increasing their harvest, Sa’im al-Dahr was so outraged that he destroyed the nose. 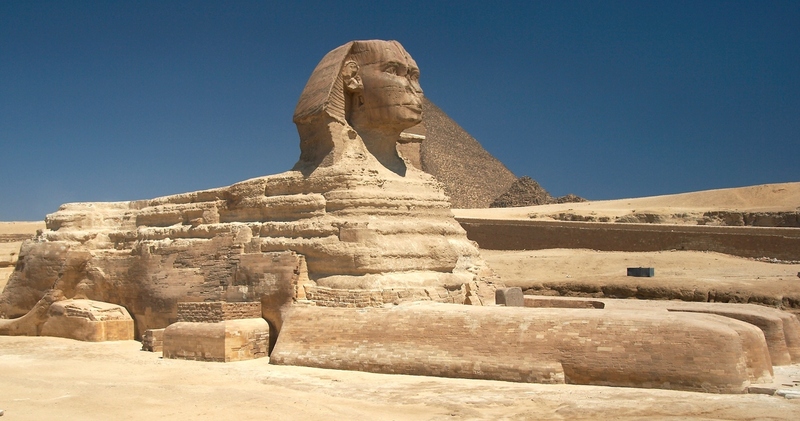 Colin Reader has proposed that the Sphinx was probably the focus of solar worship in the Early Dynastic Period, before the Giza Plateau became a necropolis in the Old Kingdom (c. 2686–2134 BC). He ties this in with his conclusions that the Sphinx, the Sphinx temple, the Causeway and the Khafra mortuary temple are all part of a complex which predates Dynasty IV (c. 2613–2494 BC). The lion has long been a symbol associated with the sun in ancient Near Eastern civilizations. Images depicting the Egyptian king in the form of a lion smiting his enemies date as far back as the Early Dynastic Period. In the New Kingdom, the Sphinx became more specifically associated with the god Hor-em-akhet (Hellenized: Harmachis) or Horus at the Horizon, which represented the pharaoh in his role as the Shesep-ankh (English: Living Image) of the god Atum. Pharaoh Amenhotep II (1427–1401 or 1397 BC) built a temple to the north east of the Sphinx nearly 1000 years after its construction, and dedicated it to the cult of Hor-em-akhet. When Locke visits Hurley in Santa Rosa Mental Health Institute, Hurley is seen painting a water-color picture of the Great Sphinx of Giza.